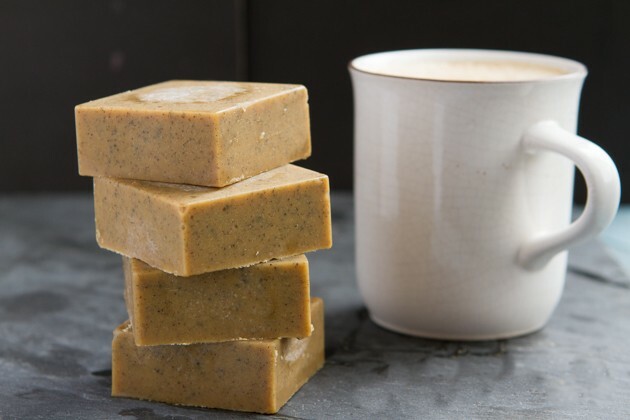 Take your fat-burning, keto Rocket Fuel Latte on-the-go with these travel-friendly keto coffee blocks. A keto Bulletproof coffee upgrade. Just add coffee or tea, shake, and enjoy. Keto Rocket Fuel Lattes are becoming a way of life for so many of the fat-fueled, keto peeps in our community. I’m constantly working to create new flavor combinations, ways to enjoy them and compiling data from my one-on-one clients, to equip you with the tools you need to rock your keto Rocket Fuel Latte experience. Not familiar with the keto Rocket Fuel Latte way? 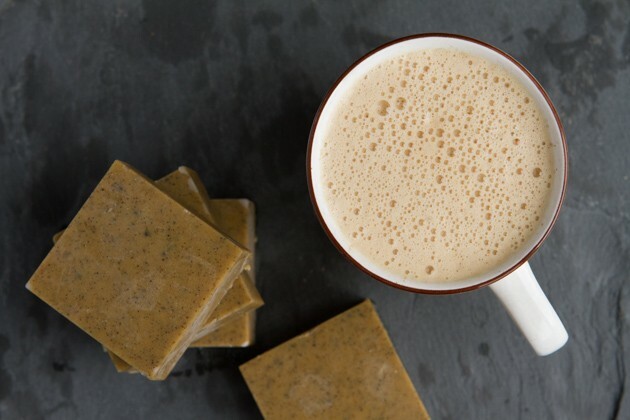 They’re basically an upgrade to the classic keto “butter coffee” or keto “Bulletproof coffee”, specifically created to regulate hormones and abolish cravings. The keto Rocket Fuel Latte came about after my bad experience drinking Bulletproof coffee. With summer around the corner for many of us, it’s time we chatted about how we can take these powerful, keto drinks on the road. The protein in a keto Rocket Fuel Latte is just as important as the liquid itself (get the keto Rocket Fuel Latte ingredient guidelines here). 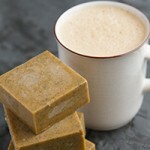 The protein source in many of my keto Rocket Fuel Latte recipes is collagen. Collagen is a keto, animal-based protein derived from the hide of bovine. It’s the most abundant protein in the body, the key to all connective tissues, and the base infrastructure of the musculoskeletal system. We need it for movement, skin elasticity, healthy bones, flowing hair, the list goes on. If you’re vegan, eating animal-sourced protein may not be okay with you. But I’ve worked with many vegans that have incorporated collagen into their eating style because of the superfood power of collagen. Your choice! 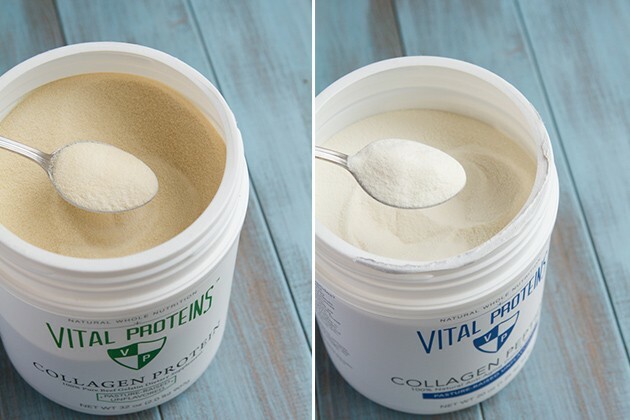 Up until this point, I’ve been quite liberal in my collagen recommendations, highlighting the options out there and opening it up to you to make the choice that best suits you. But today, I want to shine the light on one particular brand of collagen that’s caught my attention (and one that you’ve told me is your favorite, too), Vital Proteins. After much taste testing, meeting having and product research, I feel best recommending and sharing Vital Proteins with you, my friends and family. Their price is fair, their product is high-quality, their message aligns with mine, and I love the taste. Yay! 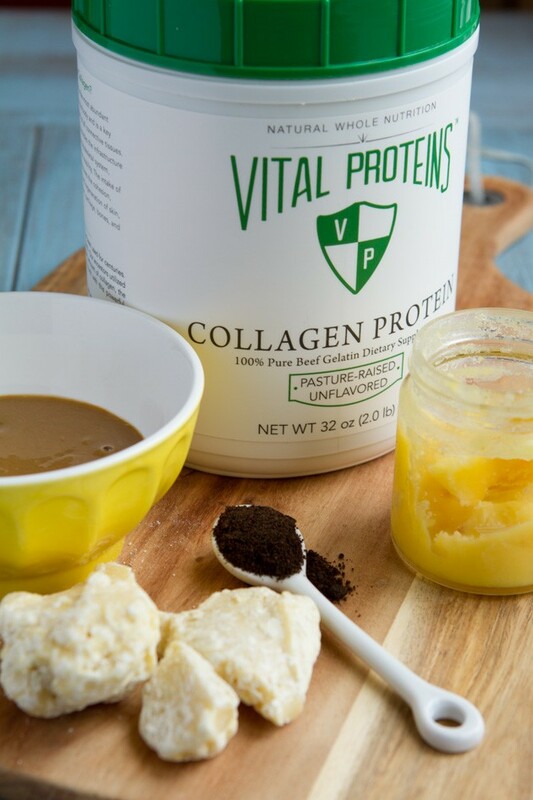 Vital Proteins Collagen is sourced from pasture-raised bovine hides from Brazil. They have 2 collagen products: Collagen Peptides and Collagen Protein Beef Gelatin. The Collagen Peptides; often referred to as “collagen”, can be added to cold or hot beverages and will not “gel” in cold liquids or alter the texture in any way. Collagen Protein Beef Gelatin; often referred to as “gelatin” will become gel-like in cold liquids, making it great for hot keto drinks… like a keto Rocket Fuel Latte. Regardless of what type of collagen you choose (the peptides or gelatin), each kind is comprised of peptides – short chain amino acids. These natural peptides are highly bio-available, digestible and soluble in cold water. Think: the most powerful, nourishing, digestive-supportive protein powder out there… that has zero taste. The only difference is that the protein product “gels” and the peptide product doesn’t. Now, let’s get to these keto coffee blocks! They’re complete with all of the keto ingredients you need to prepare a fat coffee, no matter where you’re off to. 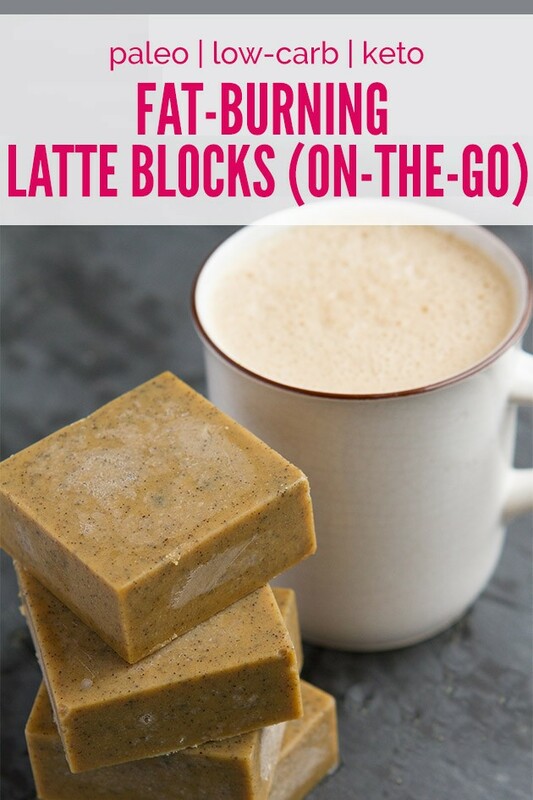 Take your fat-burning, keto Rocket Fuel Latte on the go with these travel-friendly, keto coffee blocks. Add cacao butter, ghee, sunflower butter, vanilla bean and stevia to a small saucepan. Melt ingredients on low heat. Meanwhile, add Vital Proteins Collagen Peptides or Collagen Protein Beef Gelatin to a small dish. 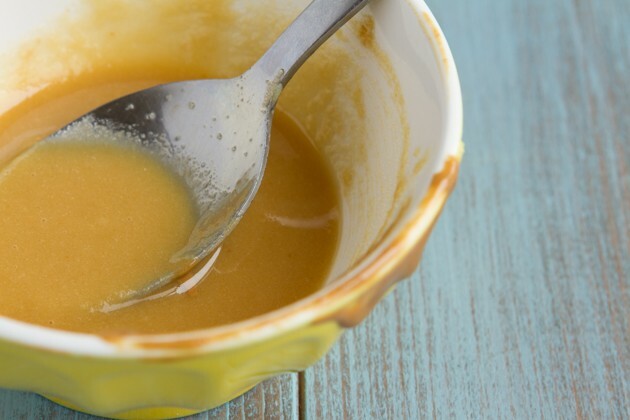 Scoop about 3 tablespoons of the hot oils into the bowl with gelatin and stir to combine, until smooth. Drop mixture into saucepan. Remove from heat and whisk until combined. 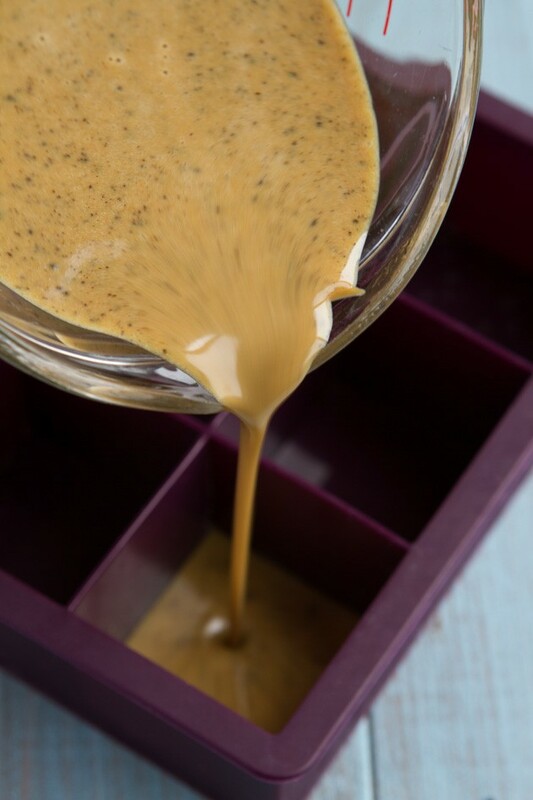 When ready to enjoy, drop the block into a mug, cover with freshly brewed coffee or tea and use a milk frother (this IKEA one is the best, and so inexpensive!) to blend the ingredients. Makes 4 blocks for 4 coffees. Travel: if you’re planning on traveling with these keto blocks for days on end, your best bet is to replace the ghee with more cacao butter. It’s the most solid of all options. Another option is to add the keto blocks to individual small mason jars and traveling with these. Ghee: it's not dairy-free, entirely. If you're straight-up allergic to dairy, you may want to avoid this and use coconut oil or cacao butter in its place. The casein and whey are removed, but some people still react to it. Cacao butter: is the caffeine-free fat from chocolate. It is very solid at room temperature, making it fabulous for this keto recipe. 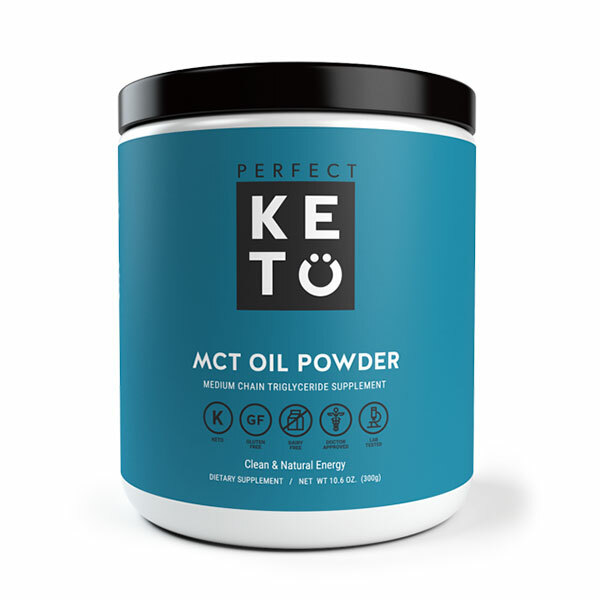 MCT oil: doesn’t solidify making it horrible for this keto recipe. Peptides vs. Gelatin: you can use either product for this recipe. I find a lot of people have the protein (gelatin) at home and; aside from jello jigglers, aren’t sure what to do with it. So, this is a good recipe for it! You can use either Vital Proteins Collagen Peptides or Collagen Protein Beef Gelatin for this keto recipe, whatever you have on hand, whatever is accessible. If you’re planning on having it with hot coffee, either Collagen Peptides or Collagen Protein Beef Gelatin will work. 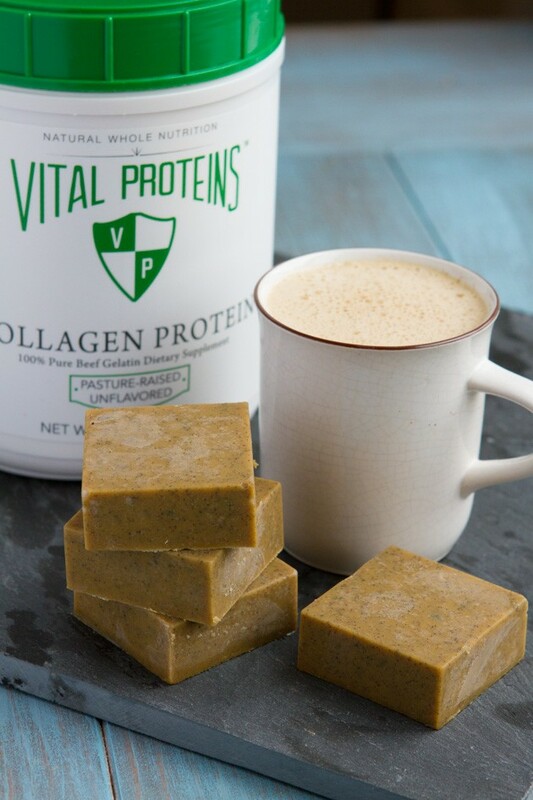 If you’re planning on chilling your coffee, stick with Collagen Peptides. Once the fats have heated up, we need to add them to a bowl with your protein and stir it around, especially if you’ve chosen to use gelatin. When you pour into large silicon molds, these ice cube molds do the trick! 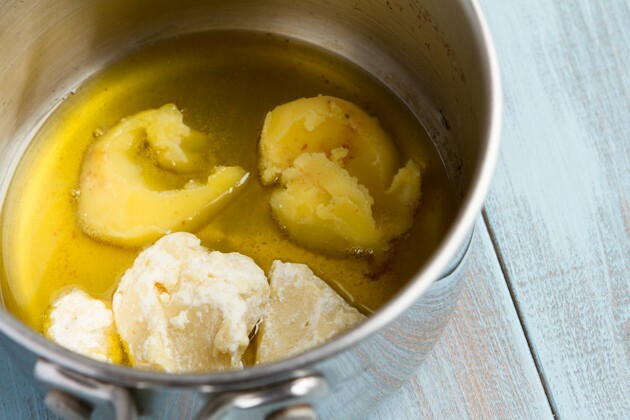 You’re going to see more of Vital Proteins on the blog this summer as we delve deeper into the benefits of collagen on health, share a couple of keto recipes with you and start up a conversation on this animal-based superfood. I’m excited to take this journey with you and chat about your collagen experience. What have you heard about collagen? Have you been interested in trying it?